As per the eleventh five-year plan document of India (2007-12), there are about 2.17 lakh regions in the country with more than half affected with excess iron, followed by fluoride, salinity, nitrate and arsenic. Further, approximately, 10 million cases of diarrhea, more than 7.2 lakh typhoid cases and 1.5 lakh viral hepatitis cases occur every year a majority of which are contributed by unclean water supply and poor sanitation. Early detection of chemical contamination in drinking water resources may save thousands of lives. Most of the detection methods for water contamination are confined to laboratory due to its time consuming measurement procedure and the use of bulky instruments such as spectrophotometer in colorimetric tests. Again most of the low cost paper strip based detection method only gives the indication of the presences of the contaminant but it is unable to quantify its exact amount. 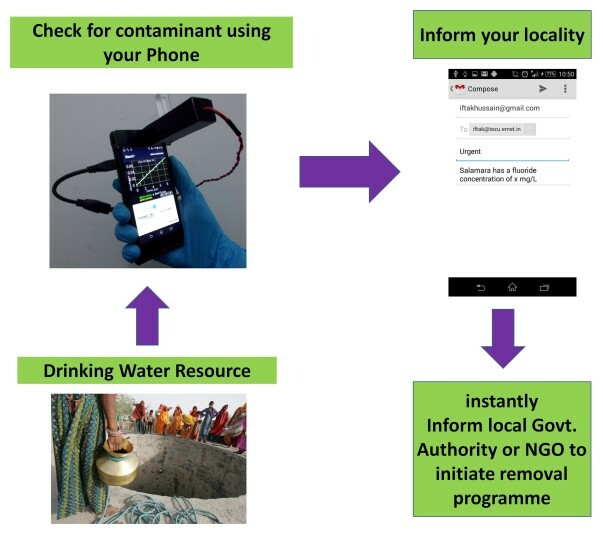 The rural and remote locations of our region are not connected directly to proper water quality monitoring facility. People from these regions are at high risk of serious health hazards due to unavailability of local laboratory support to detect chemical contamination such as fluoride contamination in their drinking water sources. Water samples from these regions are usually sent to the central water quality monitoring laboratory and the process of estimating fluoride concentration is an in-efficient and time consuming process. To initiate any removal program one has to know the chemical contaminant present in the water sources in its exact amount. 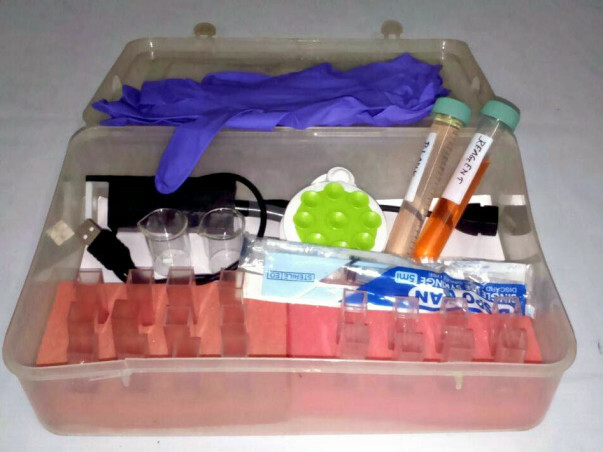 Even if the proper laboratory facility is available; it needs necessary expertise. According to TRAI the total wireless subscribers in India is around 1034.25 million till April 2016 with 447.84 million from rural areas and the remaining 568.41 million from urban areas http://www.trai.gov.in/WriteReadData/WhatsNew/Documents/PR-TSD-120315.pdf. Now, the total population of India is estimated to be 1320 million till 2016; these digits signify that it is possible to find a phone in any remote location of our country. Hi all, I am a research scholar from Applied Photonics and nano-photonics lab, Department of Physics, Tezpur University; Assam https://www.researchgate.net/profile/Iftak_Hussain2?ev=hdr_xprf&_sg=k7banFph4kvNMiBFmHKxxUpl3YFzVya35vCimAnlwsAFve4IytfjGXl-w7iAF26e . Our research group has working on developing smartphone based sensing tools which may be beneficial to the society. 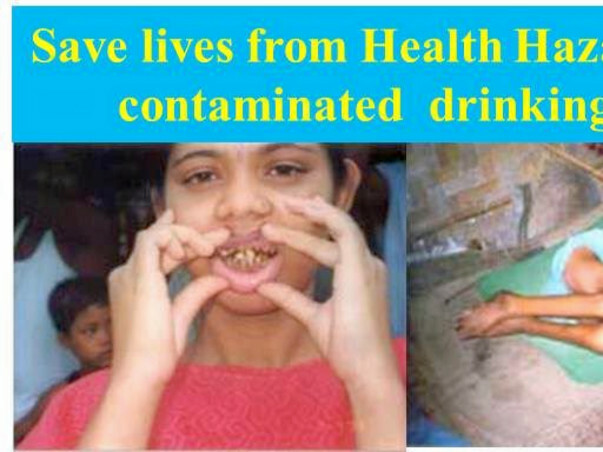 I am from Assam and people from many parts of this state such as Karbi-anglong, Nagaon, Majuli etc has suffering from serious health issues occurring from elevated amount of fluoride and arsenic in drinking water resources. The above photograph is taken from the nearby Karbi-anglong district where fluorosis becomes a nightmare for the people living there. They don't have proper laboratory facility to detect chemical contaminants such as fluoride in their drinking water resources. To initiate any removal program it is must to know the presence of the chemical contaminant. These things are in lab scale, it gives desired results. I have made the plastic cradle by hands. It can be optimized further both in hardware and software with advanced machining may be with a 3D printer, which is not available here. People only need the plastic cradle and the reagents which we can supply free of cost to a locality because a phone is available everywhere. This type of Device may significantly help people from low economic and from resource poor regions. I want to develop the same for Arsenic and Iron but the problem is that we don't have much funding. I have done these much by my research fellowship. To develop this as a low-cost kit I seriously need help. Please help me out. 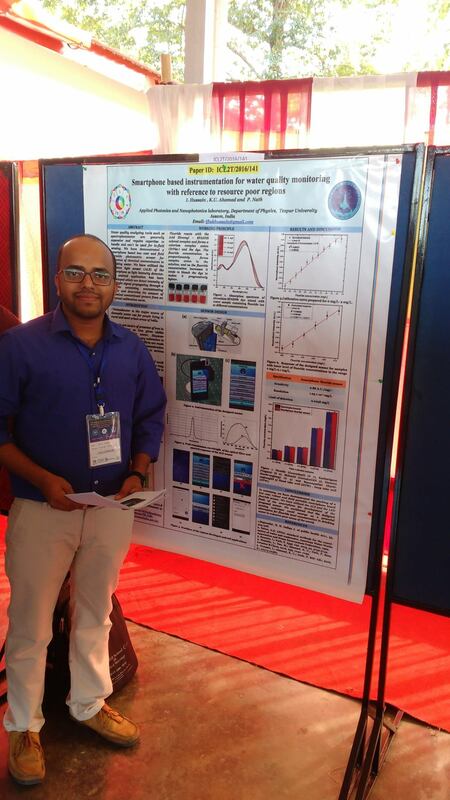 The work regarding water quality monitoring using smartphone has been demonstrated in "International Conference on Light and Light based Technologies 2016" http://luit.tezu.ernet.in/icl2t/ and got very good response from delegates. The prototypying will be done within January 31, 2016.